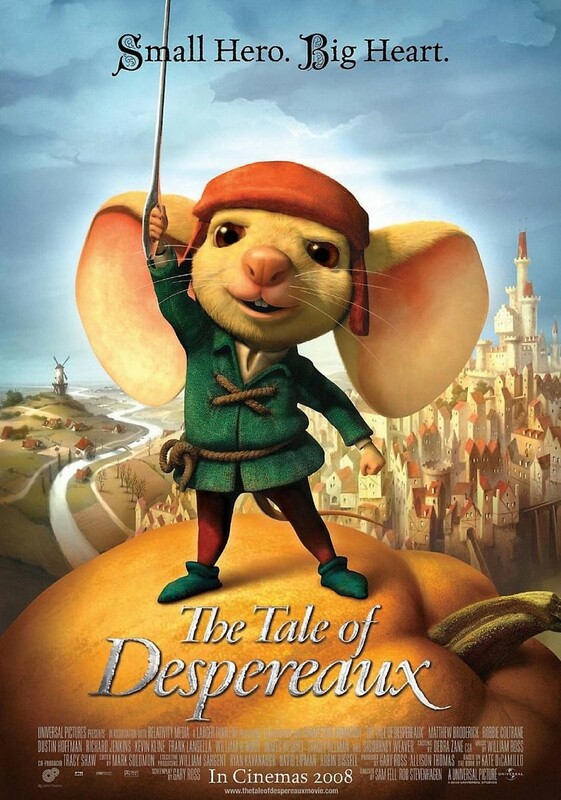 Despereaux is a tiny mouse with large ears. Unlike his cowering relatives, Despereaux finds the world a fascinating place, including the humans within it. As Despereaux meets the country's princess, he falls in love with her and humans. The mice community discovers this fact and sends Despereaux to the dungeons as punishment. Meeting a rat, Roscuro, Despereaux sets out to help the kingdom out of its melancholy state. Ever since the Queen died over a bowl of soup, the kingdom has been in mourning. No soup is allowed to be cooked. Rain stops pelting the community. Between the Princess, Despereaux and Roscuro, they must find a way to help the people move forward from grief and into the light of hope. Rats and mice need to band together to help humans help themselves.